(RED OAK, TX) January 27, 2017 – Life School, a leading North Texas charter school serving over 5,600 students, held its second annual Elementary Science Fair at its Red Oak campus on January 27th. 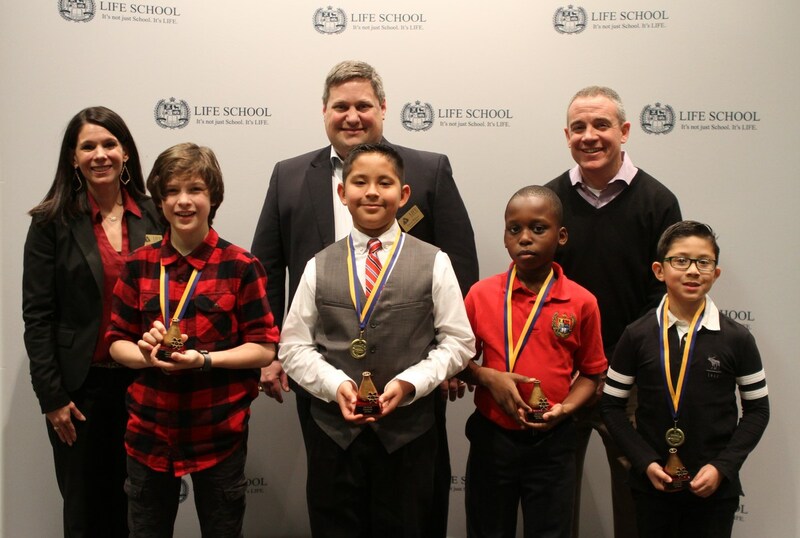 Fifty-two students in grades 3-6 from five of Life School’s campuses competed, with awards going to 1st, 2nd and 3rd place at each grade level. Each student presented a science project of their choosing based on pre-defined criteria, and used their own creativity to develop their individualized project as part of this hands-on learning experience. “The goal of the science fair is to provide students with an authentic experience that will enable them to develop critical thinking while learning through the process of inquiry,” said Melissa Brown, Life School Elementary Science Coordinator. This year’s first place winners were: 3rd Grade, Nathan Castaneda (Life School Mountain Creek); 4th Grade, Demi Lawal-Solarin (Life School Mountain Creek); 5th Grade, Junior Romero (Life School Cedar Hill); 6th Grade, Mitchell Mamola (Life School Red Oak). Photo: Back row (left to right) are Melissa Brown, District Elementary Science Coordinator; Brent Wilson, Superintendent; and Troy Mooney, Chief Academic Officer. Front row from left to right are students Mitchell Mamola, Junior Romero, Demi Lawal-Solarin and Nathan Castaneda. Life School opened as an open-enrollment public charter school in 1998 and has campuses in Oak Cliff, West Dallas, Cedar Hill, Lancaster, Red Oak and Waxahachie. For eight consecutive years, Life School has received the Texas Education Agency’s highest rating in School FIRST (Financial Integrity Rating System of Texas), a financial accountability system for charter schools. Life School’s mission is to train leaders with life skills for the 21st century by establishing strong academics, character training and a parenting program.